The average American generates almost 5 pounds of waste each day. That’s almost 1 ton of trash per person, per year. 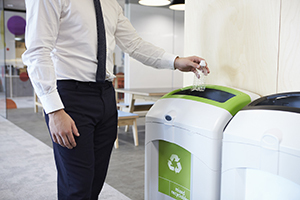 Recycling is a quick and easy way to reduce your impact on the environment. So much of today’s packaging is recyclable. Some packaging you may not even realize can be recycled. With just a few adjustments, you can lessen the amount of trash you produce. The top of your pizza box (as long as there’s no grease on it), even though the bottom half of your pizza box isn’t recyclable. Plastic wrap on things like bread, paper towels, newspapers, and dry cleaning can be recycled where you recycle your plastic shopping bags. Bring your own mug to get coffee – paper cups increase waste and take up landfill space. Look for and purchase products that are made with recycled materials. Set your thermostat lower in the winter. Lowering your thermostat by one degree can cut as much as 10% of your heating bill. Set your thermostat higher in the summer. For each degree the thermostat is set above 72 degrees, you’ll save 1% to 3% of your cooling expense. Wash clothes in cold water whenever possible. Up to 85% of the energy used to machine-wash clothes is spent heating water. Take shorter showers to reduce water usage. Compost yard trimmings, as well as coffee grounds, egg shells, and fruit and vegetable scraps to reduce landfill space and help fertilize the soil.